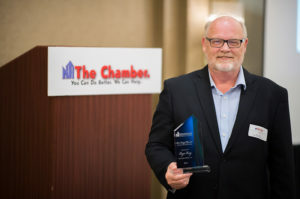 Roger Vang receives the Steve Lampi Service to the Chamber Award Diversified Plastics, Inc.
Roger Vang, chief financial officer at Diversified Plastics, Inc., was honored with the NHACC’s Steve Lampi Service to the Chamber Award. The award, started in 2011, is named in honor of the late Brooklyn Park, Minn., mayor, Steve Lampi. It is given annually to a NHACC member who has displayed dedication to the chamber’s communities. The award recognizes chamber and community leaders that serve, without personal gain, in the business, social, cultural or educational advancement of others. Award recipients contribute beyond the level of ordinary chamber membership and have the strength of character to serve as role model and mentor for present and future generations in the chamber and community. Dedicated to help make the community a better place to live and work, Vang volunteers on several community advisory panels and boards that include six years on the NHACC board of directors. He has served the NHACC as vice chair, chair and immediate past chair. He is a chief source for advice, counsel and courage to help the chamber with its continued growth. A strong supporter of the Manufacturers Consortium, Vang has also been an active member of the NHACC committees for the winter gala and leadership academy events. “I am honored to receive this award,” says Vang. “Helping area businesses grow and prosper enhances the entire community.” Vang is one of the 15 people selected by U.S. Representative Erik Paulsen to be on the congressman’s small-business task force to discuss pertinent issues. In addition, he served on the Worksite Advisory Council for Hennepin County for three years. A reputable and knowledgeable speaker, Vang has made presentations to the NHACC Leadership Academy as well as the Hennepin County Board about wellness programs. He has also spoken at the Manufacturer’s Alliance on a variety of topics, including employee stock ownership plans, health care costs and financial analysis. NHACC’s mission is to be a leading resource for members, providing programs and services to maximize their potential, while being a driving force to build stronger communities. NHACC leads, advocates and partners with area businesses as well as civic and education communities to build a stronger, more vibrant future.